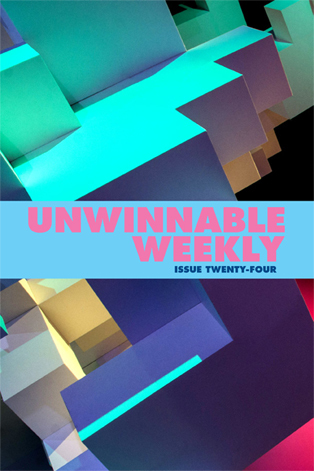 This is a reprint of the letter from the editor in Unwinnable Weekly Issue Twenty-Four – check out the excerpts at the end of the post. You can buy Issue Twenty-Four individually now, or purchase a one-month subscription to make sure you never miss and issue! In my Dungeons & Dragons group, I’m the cartographer. We play the first edition of the game and have been working our way through some of the classic modules. Those modules have their own equally classic maps, which our Dungeon Master, John, has blown up to poster size at Kinko’s. They hang there, on the wall, in full view of the entire party. What I’m saying is that we don’t need a cartographer. I do it anyway, though. Usually, my versions of the maps are rougher, warped and strange compared to the ones on the wall. No one but me ever uses them. I don’t know why I do this. Sometimes, I do this for videogames. Sometimes scribbled notes suffice. Other people do this too. I can’t tell you how delighting it is to find an old character sheet tucked in a second hand book, or annotations scrawled in the margins of a game manual. I don’t know why other people do this, but I am glad they do. I recently had a discussion about this on Twitter with the artist Kent Sheely and the writer Kaitlin Tremblay (game makers, both), who share my delight at these paper artifacts and wonder at their mysteries. Together, along with academic researcher Skot Deeming, we’ve decided to try to learn why people create these things. We think the best way to do this is to collect and archive not just the maps and notes themselves, but the stories behind them as well. To do that, we need your help, Dear Reader. If you have these kinds of maps and notes and game-related doodles, and you’re willing to share them with us, we’d love the see them and hear their stories. Get in touch with the project via email at ephemera@unwinnable.com. This idea is less than a week old, so we aren’t yet entirely sure what shape the project will take in its final form. A book? A public facing archive? We’ll keep you posted, but here and on the Unwinnable website. In this week’s cover story, Steve Haske talks to Jacob McMurray, the man behind the ambitious new exhibit at Seattle’s EMP Museum: Indie Game Revolution. Erika Barcott learns a valuable lesson about hoarding consumable items in videogames (or does she?) and Hazel Monforton takes the Assassin’s Creed series’ view on history to take. Finally, Aurelius Ventro, our favorite space marine, one again tunes in from 38,000 years in the future to give us his advice. 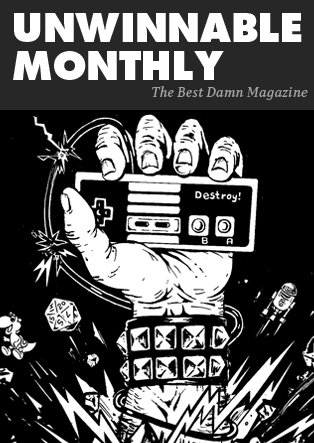 We aren’t publishing next week in observation of Thanksgiving, but we’ll still be around, rattling our beggar’s cup as we start our year end subscription drive. Get at me via email at stuhorvath@unwinnable.com. In the meantime, I wish you and yours a happy and safe holiday, if you’re American, and a happy and safe regular work week, if you’re not. I accumulated quite a lot of Golden Keys while playing Borderlands 2. And guess what? I finished the game and never used a single one of them. I have 37 Golden Keys stored up in my account. Not to mention about $121,000 – more money than I could have easily spent. Hypatia was dragged to the street and flayed alive by a mob of Christian men for her paganism, her political and academic influence and her defiance in the face of the increasing hold the Christian church had on late Roman life. What does this have to do with the Assassins and the Templars? I don’t know. Ubisoft hasn’t told this story. This is happening right now. If we’re gonna do this, it can’t just be up for three months, here’s greatest hits of indie games or whatever and then it’s done. We have the opportunity to get in on this right now and be an active, constructive commentator on what’s happening, but it has to be something that’s facing the scene as it’s happening. Aren’t you just, like, a copy of the guy from Halo? But with bigger shoulder pads?